What Is The Difference Between the Geocentric and Heliocentric Models of the Solar System? What does our Solar System really look like? 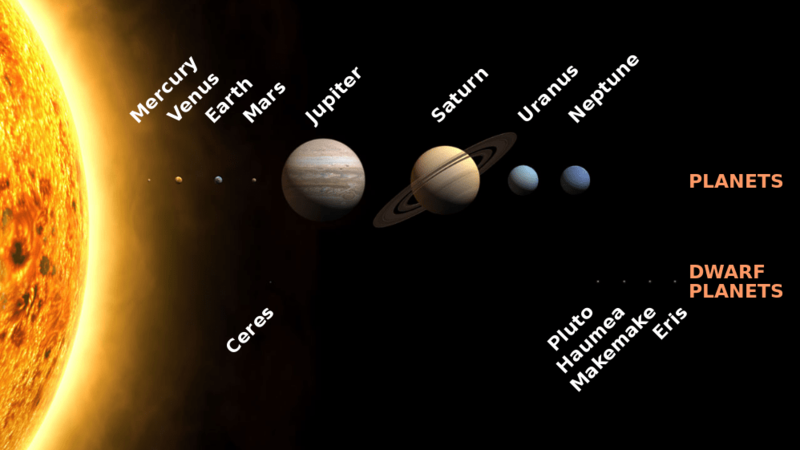 If we were to somehow fly ourselves above the plane where the Sun and the planets are, what would we see in the center of the Solar System? The answer took a while for astronomers to figure out, leading to a debate between what is known as the geocentric (Earth-centered) model and the heliocentric (Sun-centered model). The ancients understood that there were certain bright points that would appear to move among the background stars. While who exactly discovered the “naked-eye” planets (the planets you can see without a telescope) is lost in antiquity, we do know that cultures all over the world spotted them. The ancient Greeks, for example, considered the planets to include Mercury, Venus, Mars, Jupiter and Saturn — as well as the Moon and the Sun. The Earth was in the center of it all (geocentric), with these planets revolving around it. So important did this become in culture that the days of the week were named after the gods, represented by these seven moving points of light. All the same, not every Greek believed that the Earth was in the middle. Aristarchus of Samos, according to NASA, was the first known person to say that the Sun was in the center of the universe. He proposed this in the third century BCE. The idea never really caught on, and lay dormant (as far as we can tell) for several centuries. Because European scholars relied on Greek sources for their education, for centuries most people followed the teachings of Aristotle and Ptolemy, according to the Galileo Project at Rice University. But there were some things that didn’t make sense. For example, Mars occasionally appeared to move backward with respect to the stars before moving forward again. Ptolemy and others explained this using a system called epicycles, which had the planets moving in little circles within their greater orbits. While two 15th-century astronomers (Georg Peurbach and Johannes Regiomontanus) had already consulted the Greek texts for scientific errors, the project continued, it was Nicolaus Copernicus who took that understanding and applied it to astronomy. His observations would revolutionize our thinking of the world. Putting the Sun at the center of our Solar System, other astronomers began to realize, simplified the orbits for the planets. And it helped explain what was so weird about Mars. The reason it backs up in the sky is the Earth has a smaller orbit than Mars. When Earth passes by Mars in its orbit, the planet appears to go backwards. Then when Earth finishes the pass, Mars appears to move forwards again. Other supports for heliocentrism began to emerge as well. Johannes Kepler’s rules of motions of the planets (based on work from him and Tycho Brahe) are based on the heliocentric model. And in Isaac Newton’s Principia, the scientist described how the motions happen: a force called gravity, which appears to be “inversely proportional to the square of the distance between objects”, according to the University of Wisconsin-Madison. Newton’s gravity theory was later supplanted by that of Albert Einstein, who in the early 20th century proposed that gravity is instead a warping of space-time by massive objects. That said, heliocentric calculations guide spacecraft in their orbits today and the model is the best way to describe how the Sun, planets and other objects move. Universe Today has articles on both the heliocentric model and the geocentric model, and Astronomy Cast has an episode on the center of the universe.